IN FRANCE, We are used to thinking that the sea is infinitely generous. Proof: world fishing catches have multiplied five times over just 25 years. But now the golden stripes are fading. Fish resources have run out, catches tend to be depressed. Since the record production of 1989 - 100 million tonnes (t) - they have stagnated or, as in the Atlantic and North Pacific Oceans and the Mediterranean Sea, they have decreased. A silent tragedy which is both ecological and human. In the '80s, we had to note that the sea was exhaustible. Today, the Food and Agricultural Organisation (FAO) Of the United Nations considers that three quarters of fishing grounds are exploited to the bitter end, perhaps over their fertility limits. In 1990, Canada banned all cod fishing till AD 2000, because the cod could not breed enough and was doomed to disappear. Not only fished species, but even species not targeted by fisherfolk are threatened, because fishing gears are not selective enough to avoid dolphins or turtle catches. We kill 20 to 40 million fish each year. Long drift-nets used in the South Pacific Ocean for tuna fishing, trapped 23,000 cetaceans during the 1988-89 fishing season, while 44,000 albatross and petrels were killed by Japanese fishing fleets. Some people in France realised the extent of this ecological crisis and its link with the social crisis of fishworkers. French ecologists, fishworkers and industrialists agree that overfishing is leading to a virtual fish stock collapse. Says Jean- Francois Mittaine of the Fishmeal Exporters Association, "Entire fishing stocks could be exhausted in a few years if countries do not manage fish stocks with quotas, or desist from fishing in periods when it is banned." But industrialists hardly support control policies. Even worse, the industrialisation and internationalisation of fisheries extend beyond management policies, as they slash prices and exhaust local resources. So, fish stocks and fishworker communities suffer. "Industrial trawlers do not respect the fishing grounds of artisanal fisherfolk," moans Arena Diagne. This Senegalese fishworker, who fights to strengthen the Senegalese artisanal fishworkers' organisation, came to France in 1989 to examine the Breton fisherfolks' organisations, "Industrial trawlers fish at night in places where we plunge our line and our nets and they destroy all of them. In May 1990, three of our fisherfolk died when their pirogue was smashed open by a trawler." The trawlers come very close to the coast, and their very fine-knit trawls destroy a lot of species - shrimps often amount for only 10 per cent of the catches. As fish stocks exhaust, artisanat fisherfolk try to intensify their fishing and to fish in new areas. Thus, fish stocks, even in artismal fishing grounds, are over-exploited and the relationships between fishworker communities themselves become more and more conflicting. Spanish fisherfolk are in confrontation with French, Irish or Algerians, just as North American fisherfolk war the Mexicans. The traditional Organisation of artisanal fishery cannot deal adequately with this problem, particularly because many governments prefer to invest in industrial fishery in order to export and pay their international debts off. Despite its political promises, the French government is no exception to the rule. Because of the General Agreement on Trade and Tariff (GATT) negotiations, because of the European Economic Community treaty, because of the liberal ideology and the policy of deregulation and because of national debt, the government liberalised trade while trying to lessen state subsidies. Breton, Normal or Basque fishworker communities are thus harshly exposed to competition. There were 15,600 French fishing vessels of less than 50 register tonne in 1978 and only 13,400 of them in 1986. This is particularly serious because the work of one artisanal fisherperson ensures 2.5 other jobs. That is why it is now essential to negotiate a new international regulation, at least to let national social and environmental policies be possible and credible. Since 1992, the debate has focused on an international Code of Conduct for Responsible Fisheries - which was finally introduced in October 1995 under the aegis of FAO. An International Code of Conduct is a corpus of recommendations that signatory countries acknowledge as necessary. It does not have force of law but the countries commit them- selves to act in accordance with these recommendations and to urge workers and firms to do so. The proposal was in line with various previous UN conventions and treaties (See analysis: Teaching the taught) In spite of its deficiencies, this treaty represents a significant advance in international fishers' law that NGOs may use to speed up fishery reforms at local, national and regional levels. The Code can lead to another step. It asks for artisanal and industrial fishworkers to be responsible, and for states to ensure preservation and development of bio-aquatic resources, to institute protective policies for species and ecosystems in return for fishing rights, particularly by improving fishing gears selectively and by cracking down on marine pollution. It is hard to say how far the Code will be effective. After all, these are mere recommendations, which also respect a liberal economic framework (one article asks for free trade of fishing products). Nevertheless, the Code legitimises those principles which NGOS will be able to invoke against signatory countries, by political and legal means. So, the Code can be an intermediate step, inadequate in itself, but a very useful move towards a more restrictive regulation. For example, one major principle in the Code is that fisherfolk and fish breeders be involved in the elaboration of policies in order to ease the implementation of the Code: a polite but firm directive to states to hold negotiations with concerned people. The second major principle specifies that states must protect the rights and living conditions of artisanal fisherfolk and all the fishworkers. The states will be hard put to adjust this requirement within the logic of the market economy. The French artisanal fisherfolks' organisations thus supported the Code of Conduct. They were represented by the International Collective in Support of Fishworkers (ICSF) when discussing the Code at a FAO meeting. But the ICSF knows the Code's limitations. For example, the Code says nothing about the issue of fishing rights in high seas, which is thus rendered a free economic resource. Is this the best way to look after a common heritage? Moreover, the issue of these rights could have financed conservation policies of fish resources, but this was not discussed. Nevertheless, the International Code of Conduct is a test of paramount importance of our ability to manage a global environmental problem which is affecting in the short-term, economically and socially, a hundred different countries, both in the North and the Third World. At the moment, this test is still far from being a success. THIS struggle is for the future: that of ours and the fish," the late Joyachen Antony, leader of traditional fisherfolk of Kerala, had said way back in 1981, on the fifth day of his nirahara satyagraha (hunger strike) demanding that monsoon trawling be banned in the state, Uncontrolled trawling for prawns - the 'pink gold' - had led to extensive damage to the coastal ecosystem. Trawlers were introduced and encouraged by the government. Therefore, it was for the government to ensure their proper conduct. Eight years of such persistent and militant demands by smallscale fishworkers and four expert committees later, monsoon trawling was finally banned in Kerala in 1989. Meanwhile, in July 1984, Joyachen and some of his colleagues had travelled to Rome to participate in the International Conference of Fishworkers and their Supporters (ICFWS), held parallel to the Food and Agricultural Organization's (FAO) World Conference on Fisheries Management and Development. There they met their peers from maritime states as widely separated as Chile, Canada, Norway, Senegal, Indonesia and the Philippines. And they realised that the world over, the problems fisherfolk face were similar: trawler intrusions, destructive overfishing, coastal pollution, exploitation by merchants and middlemen and a poor living standard. ICFWS demanded a greater recognition of fishworkers' rights to a secure and just livelihood; the possibility of participating in policymaking which affected their lives; and better resource allocation regimes to protect their access to fishing grounds. It challenged world fishery ministers gathered at the FAO Conference to evolve strategies for fisheries which were just, participatory, self-reliant and sustainable, giving centrality to the role of fishworkers. Today, the I AO Code of Conduct for Responsible Fisheries can be taken as a late but important first step to answer this challenge. The Code arises out of the Declaration of Cancun, made at the Conference on Responsible Fishing, sponsored by the Government of Mexico in 1992. The Code has been formulated to be consistent with the United Nations Convention on the Law of the Seas of 1982, and taking into account the strategy endorsed by the 1984 FAO World Conference on Fisheries Management and Development, the 1992 Rio Declaration and the Agenda 21 of United Nations Conference on Environment and Development. It has also taken into careful account the just concluded UN Conference on Straddling Stocks and Highly Migratory Fish Stocks. The Code sets out voluntary international standards of behaviour for responsible practices in fisheries based on the general principle that the right to fish carried with it the obligation to do so in a responsible manner. Only this can ensure effective conservation and management of aquatic life. The Code recognises the interests of all those concerned with fisheries, as well as the interests of the consumers and other users. The signatory states and all the various interest groups have been entreated to apply the Code. It is composed of general principles and thematic and management articles. The management articles are very closely in line with the treaty on straddling fish stocks, but are devoid of the dimensions of equitable allocation and participatory management, so essential for conservation of the coastal marine resources. The articles on fishing operations are fairly comprehensive, covering fishing practices, gear selectivity, energy optimisation, marine environment, atmosphere protection and artificial reefs and fish aggregation devices. The articles on aquaculture urge states to ensure that aquaculture will not negatively affect the livelihood of local communities and their access to fishing grounds. It also suggests promotion of active participation of fishfarmers and their communities in the development of responsible aquaculture practices. The articles on integration of fisheries into coastal area management permit the evolution of a holistic ecosystem management. 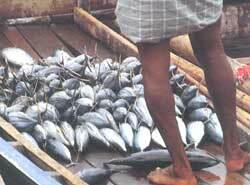 The articles on post-harvest practices and trade stress upon fairness, equity and environmental concerns top priority and calls for laws and regulations governing fish trade. The article on fisheries research stresses upon integrated and multi-disciplinary research and the setting up of appropriate institutional frameworks to promote this. It emphasises that the role of traditional knowledge and technologies needs to be investigated and strengthened. But the Code does not deal with issues specific to women in the fisheries. Neither does it specifically highlight the role of fisherfolks' organisations, nor envisage any special role for non-governmental organisations (NGOs). It is claimed that the Code is addressed to all these sectors and that they should actively ensure that it is implemented. But whose code? Whose conduct is it meant to influence? The Code was drawn up during a series of technical sessions attended by government representatives and then submitted for necessary finalisation to relevant FAO committees, the Council and the Conference. International NGOS, like Greenpeace, World Wide Fund for Nature and International Transportworkers Federation, participated actively at every stage of drawing up the Code. The interests of smallscale fishworkers were represented directly by their national organisations during some sessions, but largely through the International Collective in Support of Fishworkers - a network which was a fallout of the ICFWS of 1984. Consequently, though the Code is a document largely from above, the direct and indirect involvement of smalIscale fishworkers in influencing its formulation makes a role for them in its implementation, which is both important and possible. FAO is also planning some meaningful follow-up to monitor the Code's implementation. Measures are afoot to ensure that, as a first step, the Code is translated into as many languages as possible and widely disseminated, generating greater awareness among fisherfolks' organisations. This will also lead to international-level fishworker- NGO-government exchange programmes to learn about successful examples of responsible fisheries management and development. But in the final analysis, what is the Code all about? Joyachen is history. Many others like him the world over, too, are dead - some sacrificing their lives for the cause. Who, then, will assess the implication of this first decades of international response to struggle and carry it forward? While the nation state is the custodian of the living resources within the exclusive economic zone (EEZ), its careful stewardship can only be undertaken by those who have a certain genuine 'connectedness' to the resource. Only smalIscale fishworkers like Joyachen qualify for this. They see the 'connectedness' between their future and that of the fish. But they hardly need a code for their conduct. They have been responsible for generations, and they had demanded the code for protection against other stakeholders/ claimants to marine resource. in that sense, the Code is a good placard to be raised in the struggle for more responsible fishing, in which the mighty are accountable for their actions and the weak not ruined. Moving towards responsible fisheries in the 21st century will depend largely on the manner in which coastal smallscale fishing communities and other fishworkers can push for a 'globalisation' of their concerns - dealing simultaneously with the global and the local.